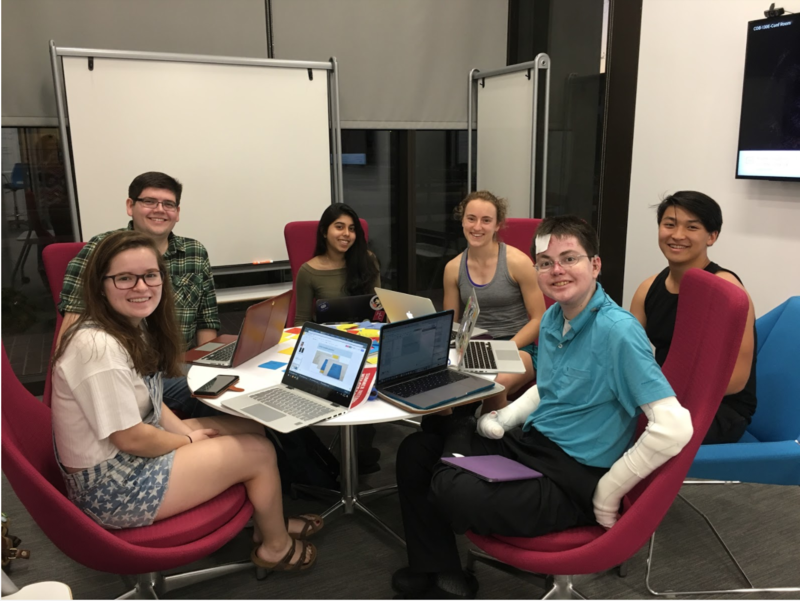 How can we create a durable, comfortable, modular device to assist users without the use of their fingers to write efficiently? 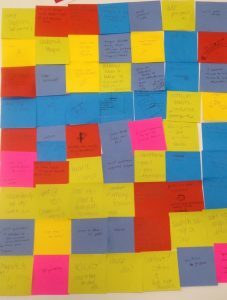 These post its illustrate our idea of having different places to attach a writing utensil on our device to accommodate for different writing situations (like at a desk vs on a board). For vertical writing, the writing utensil would be parallel to the forearm and for traditional written notes, the writing utensil would be at a 45° angle to the paper. This solution relates back to our key insight of modularity and considering all use cases because we are considering the different situations in which a person may want to write something. We will evaluate this concept first by determining if it is feasible with our constraint to materials and size (we don’t want the device to be too bulky). Then we will measure the success of this solution by determining if it as useful and seamless and we thought it would be. 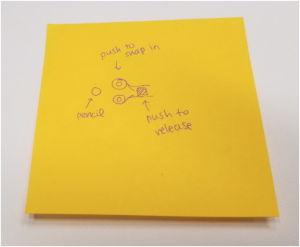 This post it illustrates our idea of connecting the utensil to the device. This idea is to have a sort of fishnet latch where you can just align and push the pen in and then it will stay secure while you write until you push down somewhere to release the pen. This relates back to our key insight of considering all use cases because we noticed how many of the existing solutions didn’t consider putting the writing utensil into the device as a use case and we want our user to completely use our solution independently. This design would hopefully make putting the writing utensil into the device easy. To measure the success of this design, we can see how well the writing utensil stays in place and how secure it is. The writing utensil must be secure in its holder if our device is to work well. 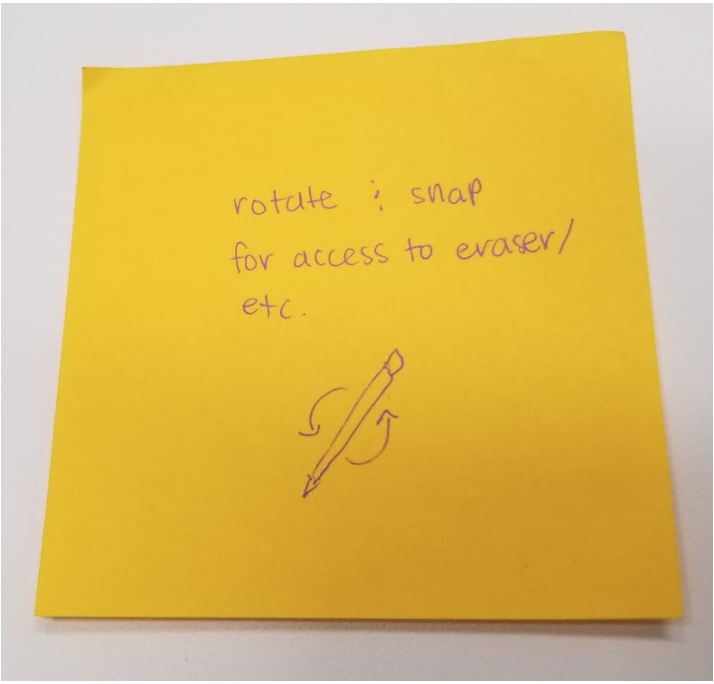 This post it shows our idea of having the device easy to rotate so that the user can easily flip the pencil over to erase. To measure the success of this design, we can see if it doesn’t turn randomly in a way that negatively impacts the user when they are trying to write. We have a lot of ideas and for our preliminary prototypes we are going to test our ideas to see which ones work in the way we imagine them to. We anticipate finding ideas and designs that work better than others. The design that we are going to move forward with for our first prototype is a device that has multiple utensil holding ports which are like clamps on the writing utensil. We are also going to use some combination of velcro and memory foam for comfort and ease of use. Once we get a preliminary prototype working, we will move on to a more advanced prototype. Overall, our feedback from our MSR was very positive. A lot of people really liked the fact that we did an empathy exercise to start brainstorming some preliminary designs. A lot of the feedback was also really positive towards how we took the time to look at current devices and solutions to the problem and analyzing them. For these devices, we were looking for where they fell short and how we can improve on them. Somebody mentioned having a user group to test on and that is something that we are still working on. We also got a lot of comments about our measures of success being too broad and to expand them beyond comfort but also dexterity, assembly, and design appeal.